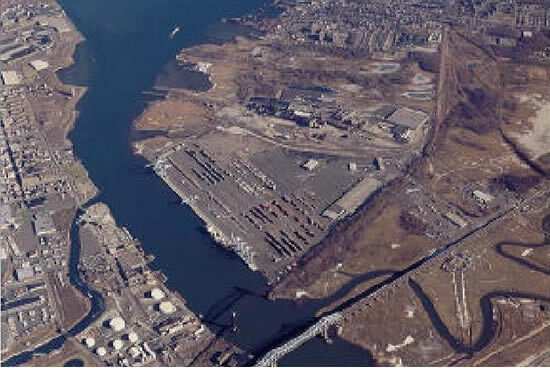 The Army began to acquire land at Kings Bay in 1954 on which it planned to build a military ocean terminal which would be used to ship ammunition in event of a national emergency. Construction began in 1956 and was completed two years later at a cost of $11 million. The most prominent feature of the terminal was a 2000 footlong, 87 foot-wide concrete and steel wharf, with three parallel railroad tracks, enabling simultaneous loading of several ammunition ships. A 10 mile-long, 200 foot-wide channel, dredged by the Army to 32 feet provided access between the bay and the ocean via the St. Marys channel. Elsewhere the Army built 47 miles of railroad track. The base was never activated. In 1975 there were negotiations between the U.S. and Spain over the continued basing of ballistic missile submarines at Rota, Spain. The resulting 1976 treaty called for withdrawal of the Navy squadron by July 1979. Some sixty sites along the Atlantic and Gulf coasts were evaluated as a replacement and by the summer of 1976 the number was reduced to five: Narragansett Bay, RI; Cheatham Annex, VA; Charleston, SC; Mosquito Lagoon, FL; and Kings Bay, GA. Kings Bay was chosen to be the support base for Squadron Sixteen in November 1976, with initial homeporting of the submarines and crews in Charleston, SC. The relocation occured in July 1979 with a submarine tender (USS Canopus, AS-34), a floating dry dock (USS Oak Ridge, ARDM-1), and eight SSBNs. This modest four year effort cost $125 million. In May 1979 Kings Bay was selected as the permanent east coast Trident homeport, refit site, and training base for Ohio-class SSBNs. This major decade-long effort cost several billion dollars. On March 29, 1990 the Navy declared the USS Tennessee (SSBN 734) operational as it went on its first patrol from Kings Bay, carrying Trident II SLBMs. On September 6, 1997 the 18th and last Ohio-class submarine (the USS Louisiana) was commissioned, the tenth to be based at Kings Bay. 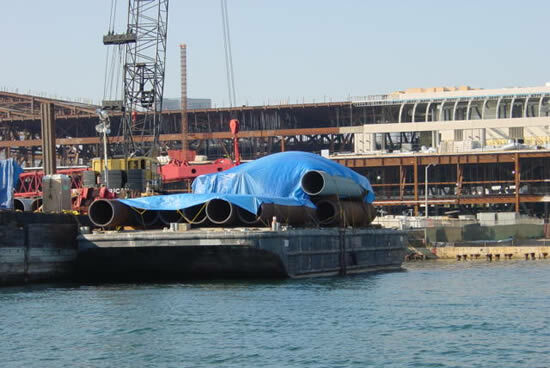 Mandal Pipe supplied the foundation piling for the construction of the Re-Fit Wharf, Graving Dock and Explosive Handling Wharf. The Long Island Rail Road or LIRR is a commuter rail system serving the length of Long Island, New York that has been classified as a Class II railroad by the Surface Transportation Board. It is the busiest commuter railroad in North America, servicing around 81 million passengers each year, and the oldest US railroad still operating under its original name and charter. In order to upgrade its existing track and position itself for future expansion, upgrades to existing railroad bridges have been undertaken. 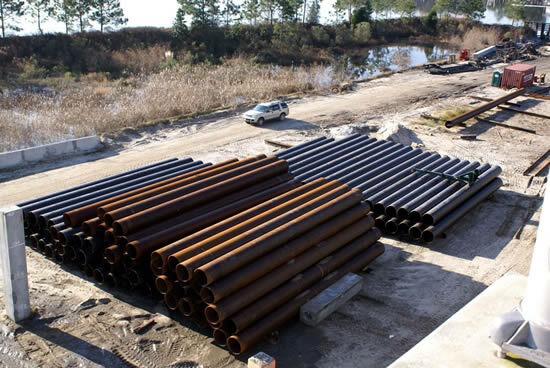 At Powell Creek and at Hog Island, Mandal Pipe Company has supplied the overlength piling for the bridge replacements. 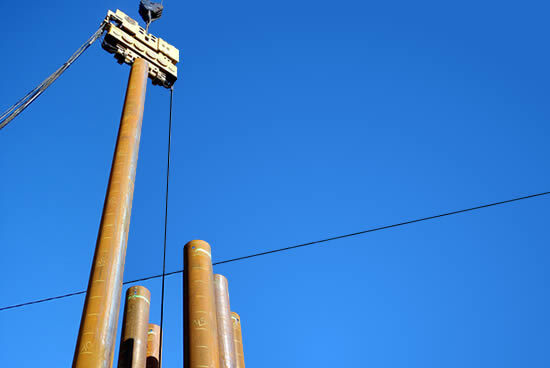 This piling is supplied weekly for the pile driving work which can only be done on the weekends during the periods of slack commuter traffic. 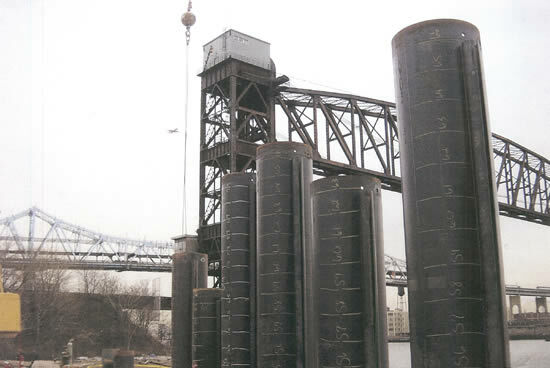 At both sites, the piling is driven around and through the existing railroad bridges during the weekend outages. 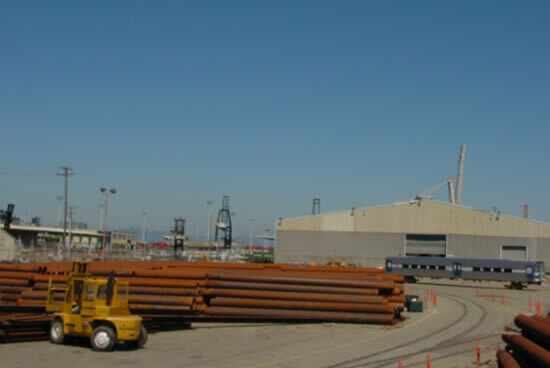 Once the 144 pieces of 70′ long 20″ diameter steel pipe piles are installed, they will be internally cleaned, rebar cages will be installed and then they will be filled with concrete. After the pipe piling foundation is completed the contractor will remove and replace both bridges simultaneously in 2 weekend outages. 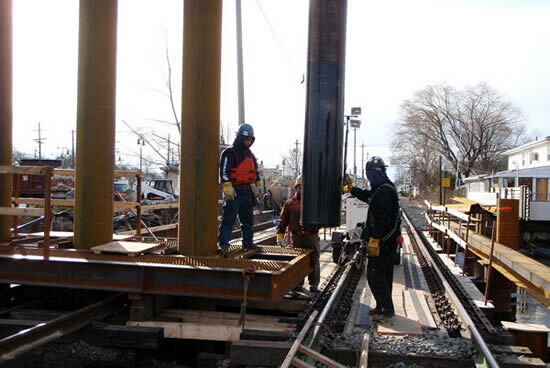 Throughout the job the railroad will be up and running during the week so that service to the customers of the Long Island Railroad will continue unabated. 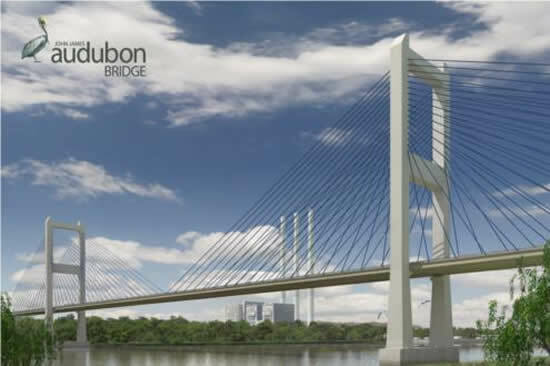 The John J. Audubon Bridge project is a new Mississippi River crossing between Pointe Coupee and West Feliciana parishes in south central Louisiana. The bridge-proposed to be the longest cable-stayed bridge in North America when complete–will replace an existing ferry between the communities of New Roads and St. Francisville. The bridge will also serve as the only bridge structure on the Mississippi River between Natchez, Mississippi and Baton Rouge, Louisiana (approximately 90 river miles). 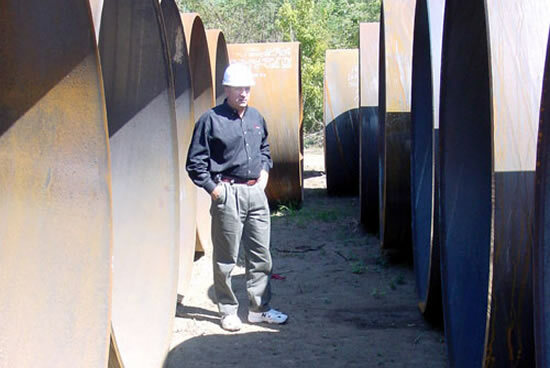 Over 6000 Tons of Large Diameter Steel Spiralweld pipe ranging in size from 48? to 96? O.D. 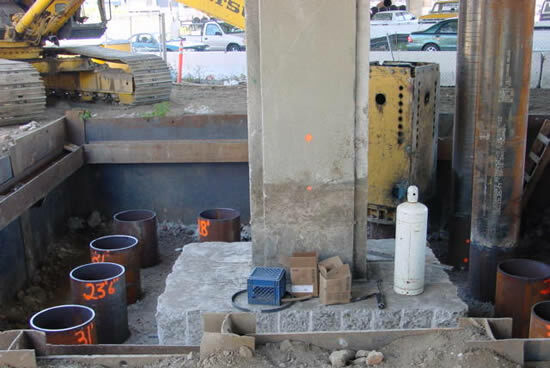 and in wall thicknesses from .500 to 1.000 inches was supplied by Mandal Pipe Company for both the Pier foundations and the temporary work tressel. 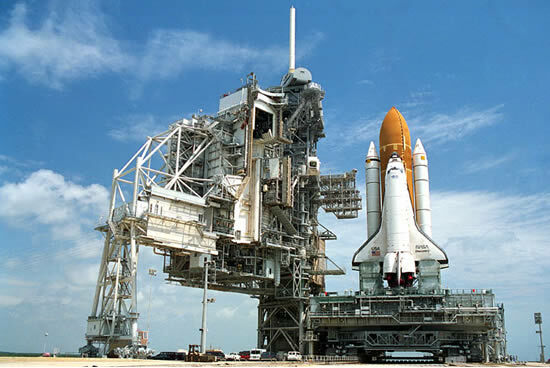 Specially designed trailers were constructed to facilitate the transportation of the massive 30 Ton pieces of 96? 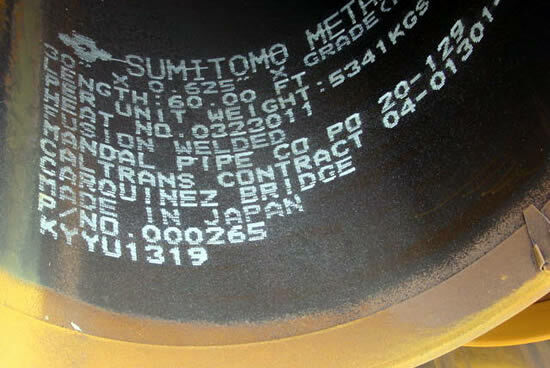 x 1.000 steel caissons manufactured in 60? lengths. 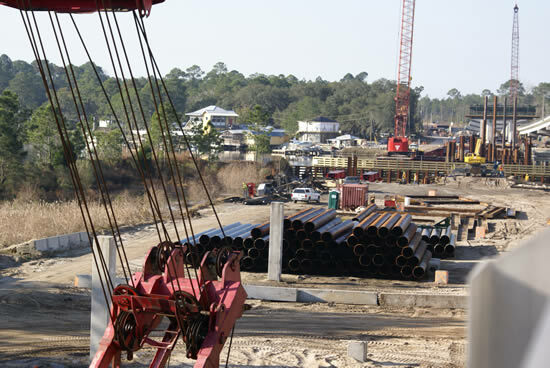 The project is being constructed by Audubon Bridge Constructors and is expected to be complete by the summer of 2010. 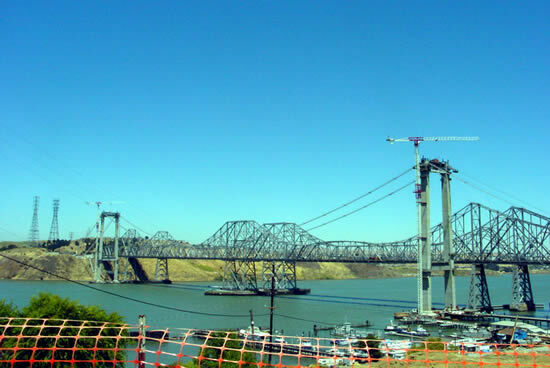 FCI Constructors and Cleveland Bridge began joint venture construction on the New Carquinez Bridge on Interstate 80 spanning the Carquinez Straits north of Oakland California in June of 2000. This bridge was the fi rst suspension bridge erected in the United States in nearly 30 years and the largest construction project ever bid in California at the time. 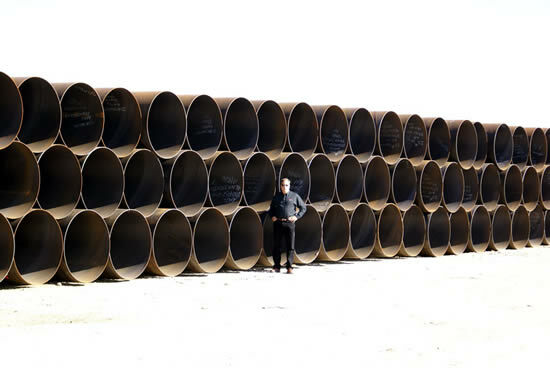 Mandal Pipe Company supplied over 6000 tons of large diameter heavy wall pipe to form the foundation for the North and South anchorages. 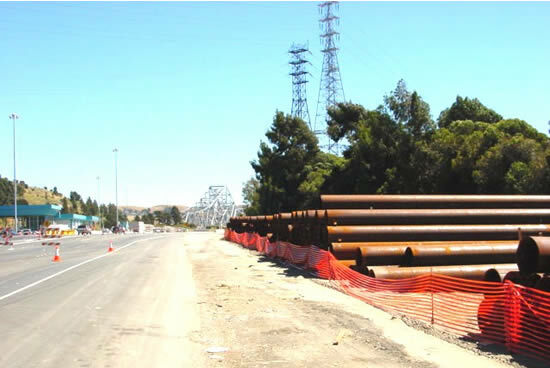 These anchorages will support the tremendous loads necessary to carry the weight of the bridge deck and the heavy traffic volume anticipated along Interstate 80. 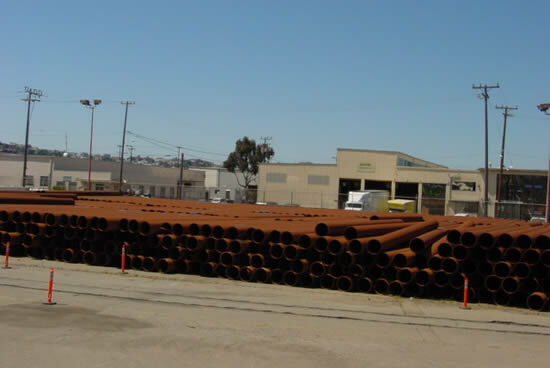 Utilizing over 350 individual truck deliveries, the 60 foot long 30″ diameter pipe was logistically positioned in storage yards near its final destination points. The Port of Houston is a 25-mile-long complex of diversified public and private facilities located just a few hours? sailing time from the Gulf of Mexico. 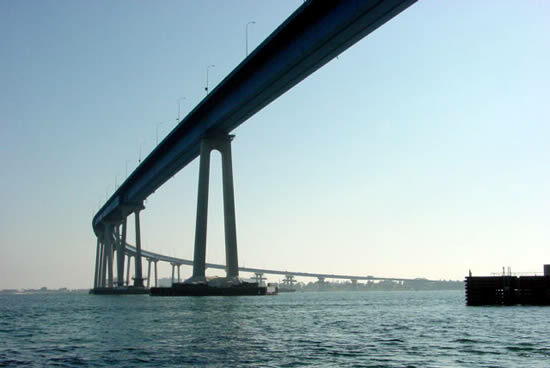 The port is ranked first in the United States in foreign waterborne tonnage and second in the U.S. in total tonnage. 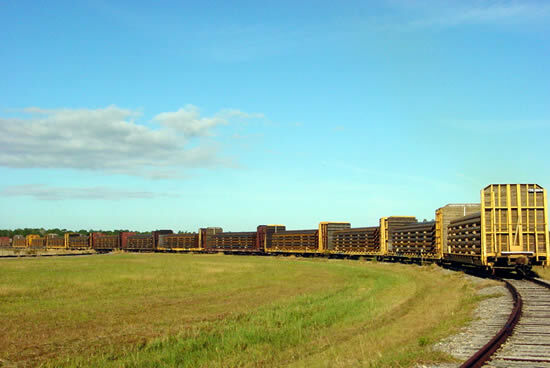 More than 225 million tons of cargo move through the Port of Houston annually. 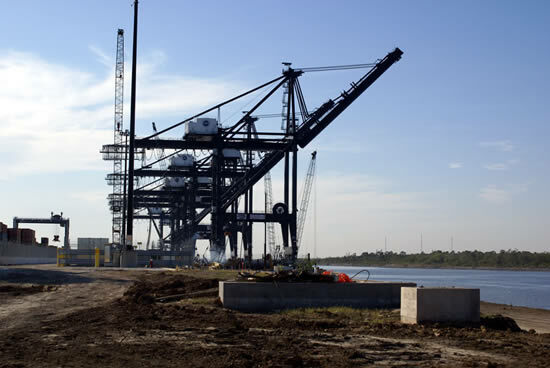 A total of 8,053 vessel calls were recorded at the Port of Houston during the year 2008. All together, the port authority and its neighbors along the ship channel are a large and vibrant component to the regional economy. The Port of Houston has an impressive listing of firsts, from unloading the world?s first container ship to becoming the country?s first port to receive ISO 14001 compliance. 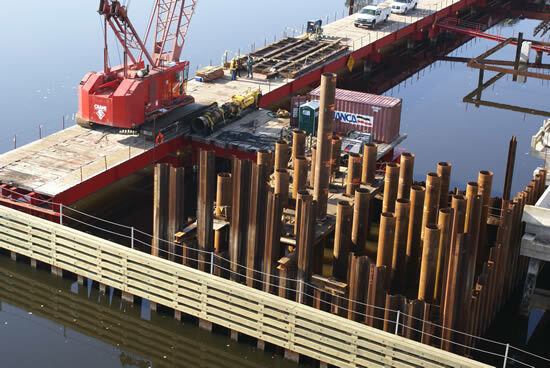 In order to meet future demands, an expansion was undertaken in late 2008 which required the building of the heavy foundations needed to support the new dock cranes used to unload the vessels. 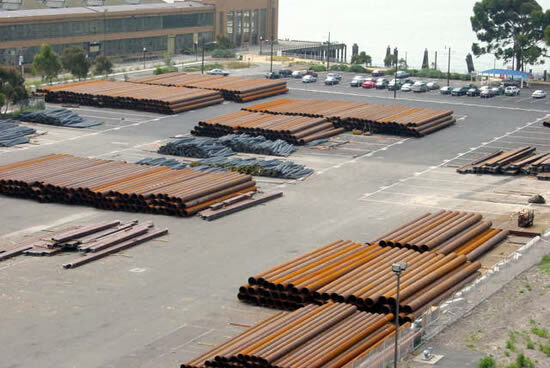 Mandal Pipe Company supplied the large diameter steel caissons necessary for supporting the heavy loads by shipping 19000? of 48? and 5000? of 36? Spiralweld pipe in 50? lengths. 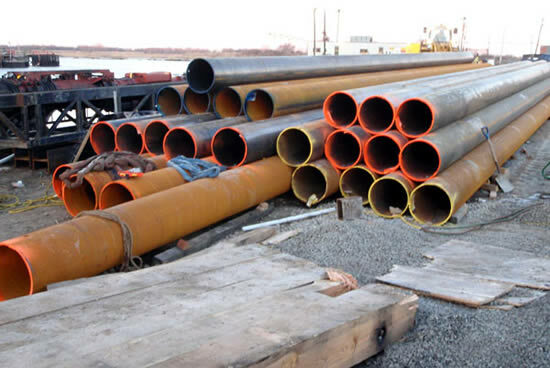 All in all, over 125 truck loads of pipe were delivered on time and within the specification required by the design engineer. Another product ?Melted and Manufactured? 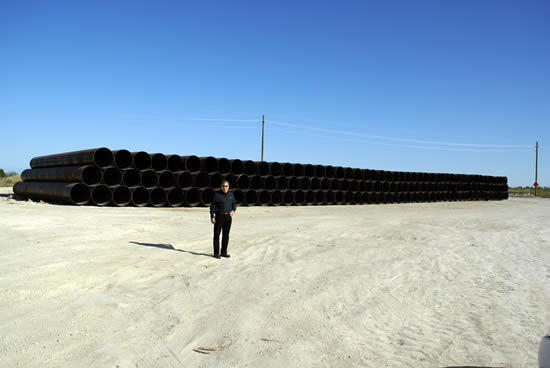 in the USA provided my Mandal Pipe helping to keep our infrastructure prepared for the future. 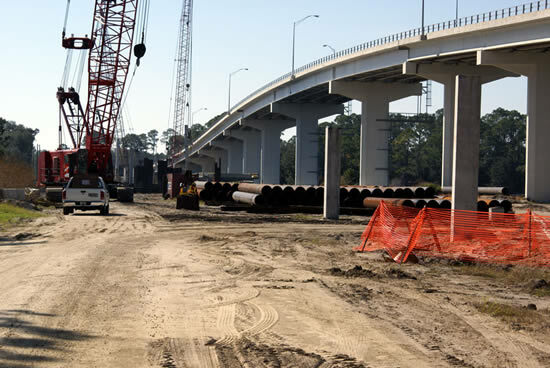 The West Bay Bridge widening project near Panama City, Florida is critical to the Hurricane evacuation plans for the Panama City/Fort Walton Beach areas and will provide the gateway to the new regional airport scheduled for construction in the near future. 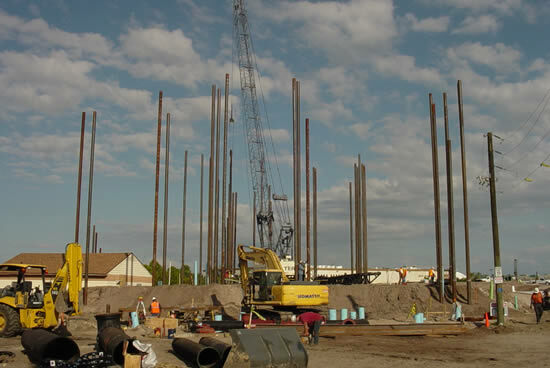 Pile driving for the foundation piers came to a halt due to severe and unforeseen jobsite conditions. With the failure of the 30? 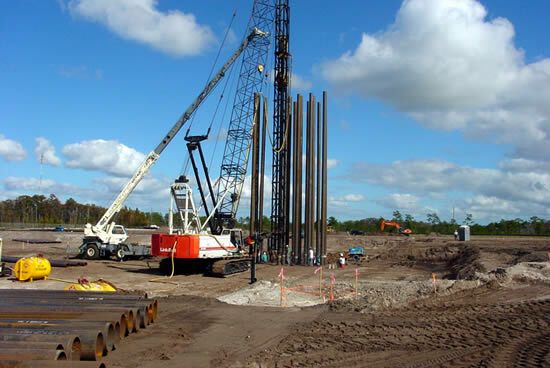 square concrete piles to pass pre-determined requirements, the completion date for the project prior to the next Hurricane season was placed in jeopardy. 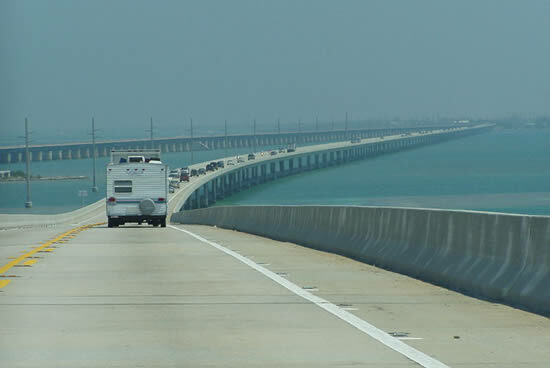 The contractor, working with consulting engineers and the Florida Department of Transportation, determined that 30? 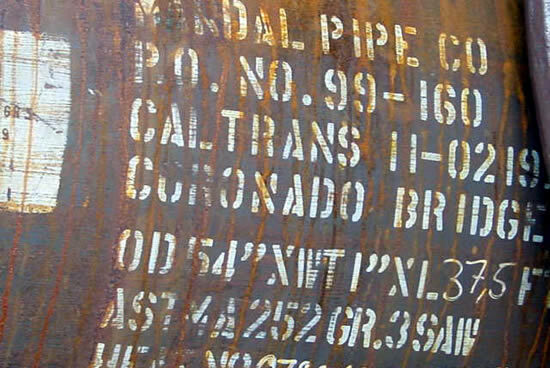 diameter steel pipe with a heavy 5/8? wall thickness would safely and adequately overcome the existing problems. A quick delivery of the 40,000? of material was imperative. 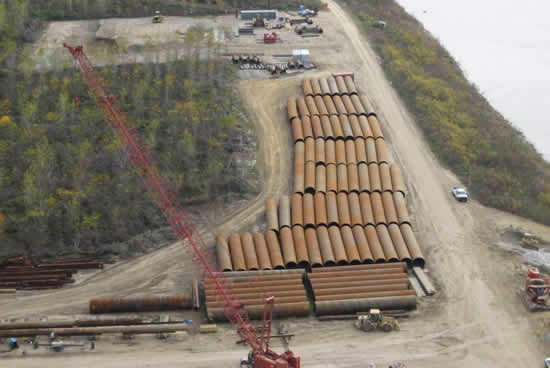 Mandal Pipe Company responded by supplying the project with over 175 truckloads of steel pipe allowing for the work schedule to recover the original lost time. The Curtis H. Stanton Energy Center is a strategically phased “powerhouse” comprising a portfolio of clean, modern, fuel-diverse environmentally sound power-generation equipment. Newsweek magazine has described it as “non-polluting.” Others just call it a good neighbor. 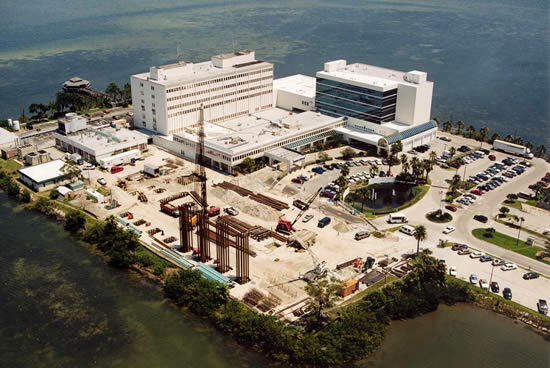 With good reason: When it comes to protecting the environment, OUC goes above and beyond – always using the best technology available at the time of construction. 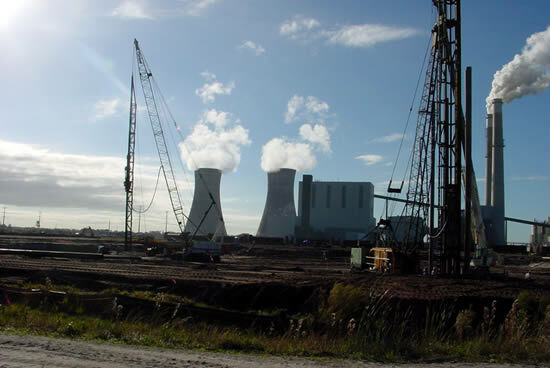 Growing demand for clean dependable power in central Florida was met with the construction of the co-generating Electric Power plant near Orlando Florida. 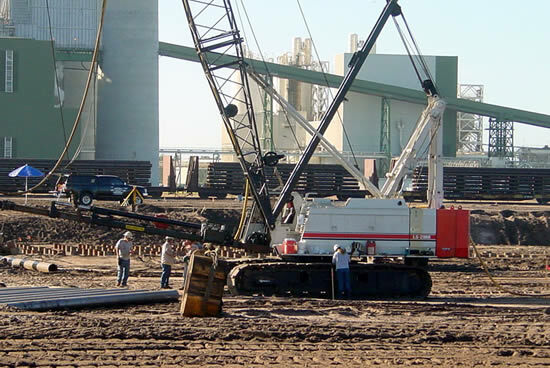 Utilizing gas from non interruptible pipelines, the Stanton A unit began commercial operation to help OUC maintain stable power prices by further diversifying their fuel mix and maintaining flexibility through the use of purchased-power agreements. The combined cycle plant includes two natural gas-fired combustion turbines, two heat recovery steam generators and a steam turbine. The project was developed in joint partnership with the Atlanta based Southern Company. 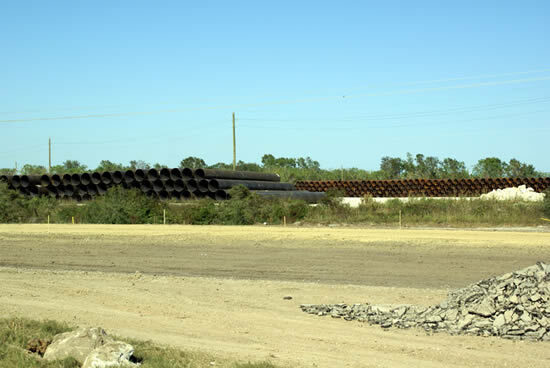 Mandal Pipe provided over 100,000′ of 14″ OD steel pipe to provide the foundation for these units in 50 and 60 foot lengths. 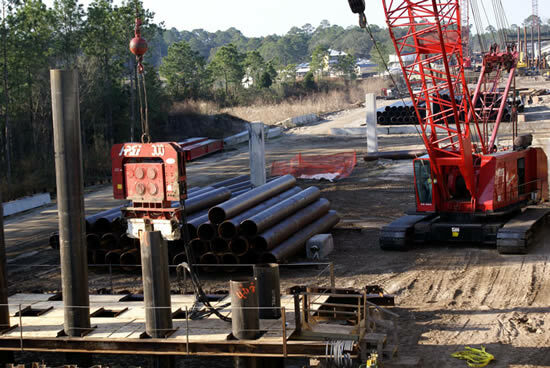 With a critical delivery schedule, sixty five (65) truckloads of the over length steel pipe were rushed to the lay down area to feed the two rigs operated by Gulf Foundation out of Tampa, Florida. 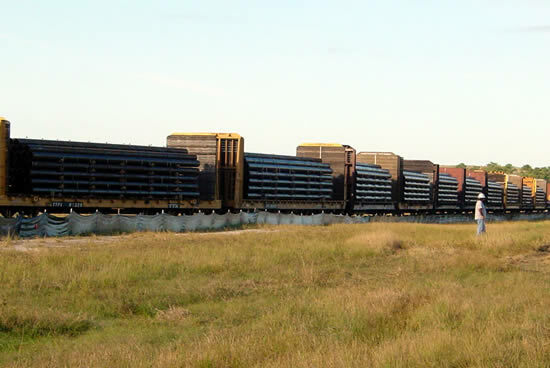 Then thirty two (32) fully loaded bulkhead rail cars arrived on time to provide a continuous product stream to the jobsite, allowing the contractor to operate both rigs simultaneously throughout the driving period. 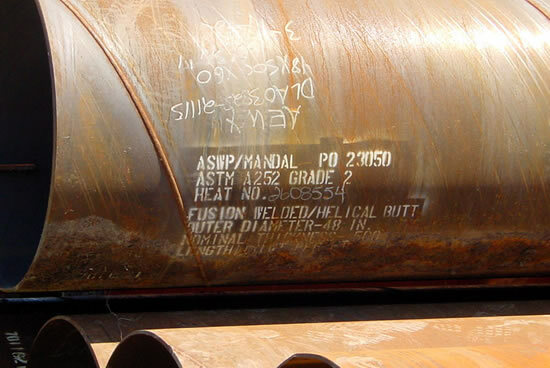 Another product “Melted and Manufactured in the USA” provided by MANDAL PIPE helping to keep our infrastructure perpared for the future. 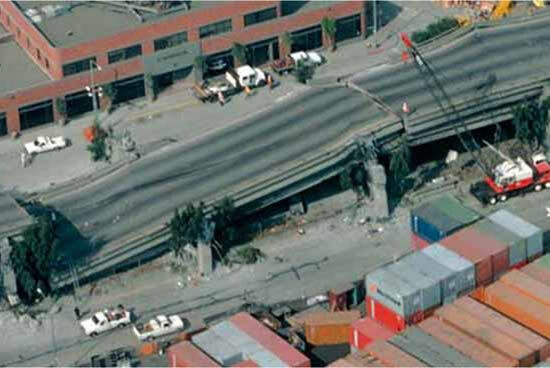 The damage done by the earthquakes of 1989 prompted the California State Legislature to mandate a statewide bridge seismic retrofitting program. 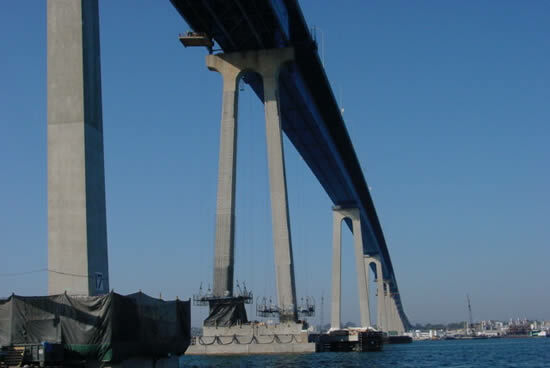 The San Francisco-Oakland Bay Bridge was one of the largest elements in teh seismic retrofit plan. 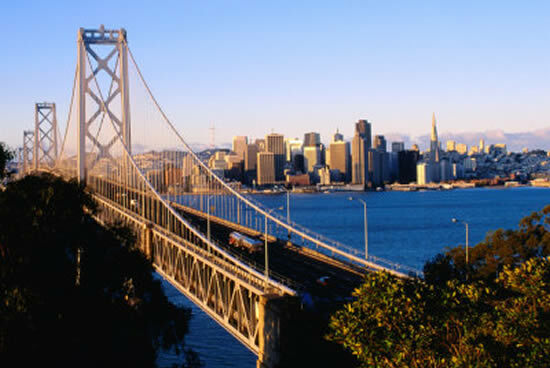 A 1.1 mile span of elevated highway, which connects to the actual bridge, was of major importance to the vitality of downtown San Francisco. Approximately 246,000 vehicles use the approaches on a daily basis. 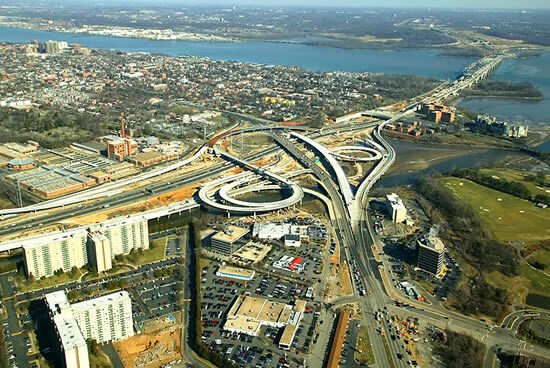 Due to this heavy volume of traffic, engineers pinpointed it as a major problem area. The strategy for strengthening the elevated approaches was to add deeper pilings, larger foundations, and stronger support columns. 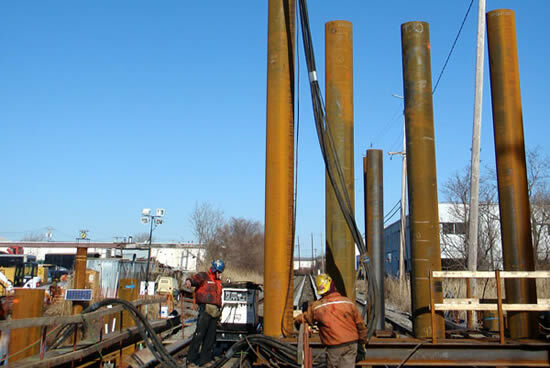 Mandal Pipe Company has been an integral participant in the retrofit project, supplying 105,000′ of 24″ diameter, 3/4″ thick steel pipe to be used as piling. 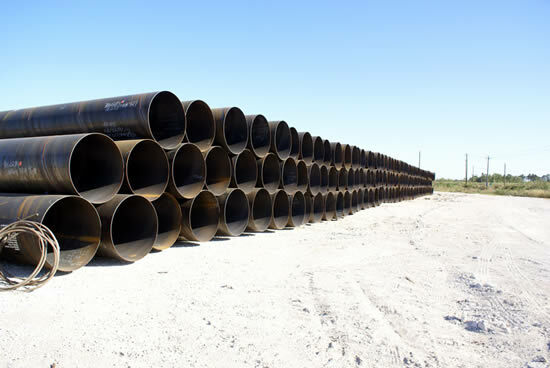 With on time delivery, Mandal Pipe Company supplied a quality product, at a tremendous savings to the contractor.